1 Finally, brothers, pray for us that the message of the Lord may spread rapidly and be honoured, just as it was with you. 2 And pray that we may be delivered from wicked and evil men, for not everyone has faith. 3 But the Lord is faithful, and he will strengthen and protect you from the evil one. 4 We have confidence in the Lord that you are doing and will continue to do the things we command. 5 May the Lord direct your hearts into God’s love and Christ’s perseverance. This scene is a visual representation of a theological truth, not a literal, real world scene. The primary source of light for this scene comes from the blue glow surrounding the family in the centre. A Hebrew family walking (father, mother & young son, with a little dog), daemons surrounding these figures. 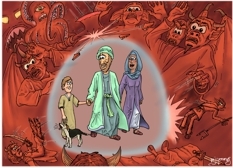 This is a visual representation of the apostle Paul’s letter to the Thessalonian church: specifically it shows verse 3 which reads “But the Lord is faithful, and he will strengthen and protect you from the evil one.” I have illustrated this idea of protection by showing a family walking along, with a blue glow, rather like an unseen supernatural shield, which is repelling various daemonic beings as they seek to attack the family. The family can’t see the daemons, hence their happy, unconcerned expressions, although the dog is barking so perhaps it can see them! Purpose of the second letter to the Thessalonian church.